I was asked to make a couple of aprons for a show in Santa Barbara, called "Food Confessions." The show sounds terrific from what I have heard. Here is the cherry apron that I made. I am happy the way that it turned out. I only get credit for making the apron. The other credit belongs to Marcy, who is the costume designer for this show. 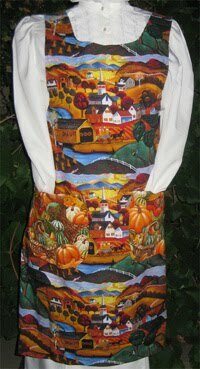 We have some gorgeous new Fall and other theme cobbler aprons to be listed soon at countrynmore. 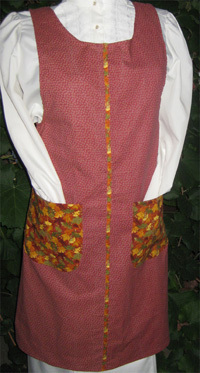 These new aprons will be listed the week of September 10th, plus new aprons are almost ready. Choose from Fall, country, garden, floral, bird, and Christmas theme cobbler aprons. These vintage canning (link to vintage aprons) aprons are not only gorgeous, but they provide full coverage. All of the aprons are pre-shrunk. 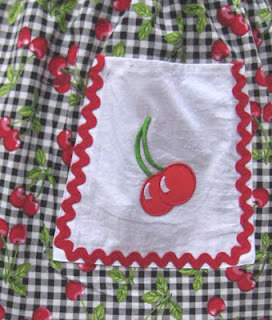 Just added some more new vintage canning aprons to www.countrynmore.com. These aprons can be worn while working outdoors, or in the kitchen either preparing your favorite meal, or canning your fresh vegetables or fruit. Some of our new vintage canning aprons are trimmed with vintage lace. They are just gorgeous in every way. 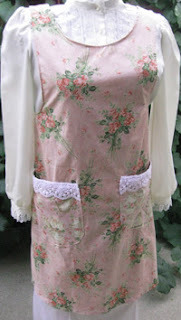 Here is one of the aprons: This apron has both vintage lace and a floral trim. I like the added touch that the vintage lace adds to the vintage canning apron. Currently, we have the canning apron in Large, but we will be adding smaller sizes to our online store in the coming months. The print on this apron is so gorgeous. Of course, it is on packages up to 13 oz., but www.countrynmore.com now can ship First Class Mail. Yeah! This has been a long time coming. So many customers want to order one item, but paying Priority Mail is costly for just the one item. I am careful who or if I donate, because I get a lot of requests. This organization provides financial aid and support to community cancer patients, their immediate families and caregivers. Having cancer in the first place is scary, and it is not only draining for the patient, but for their family members, both physically, mentally, but financially. I really like the way that this came out. Finally had a chance to make more aprons. These aprons are gorgeous. Although they are reversible, I am only showing the one side. You can view the reverse side by going to www.countrynmore.com. By clicking on the image, you will be sent to a new page, with two images. When yo click on the image, you can see a larger image of the apron. Sometimes, the aprons show up in New Products, before showing up in the category. There are new aprons coming to Country N' More, within the next week. Please check back soon. There are gorgeous rose floral prints, that will look fabulous in the reversible cobbler aprons. 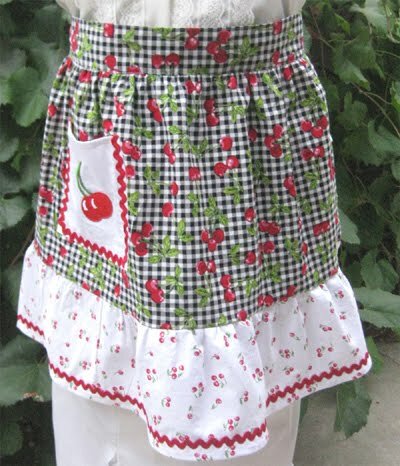 Of course, we have many nice aprons right now on the website. All the fabric panels and fabric (both in the Etsy store or in our fabric store), are out of print. These panels are perfect for welcoming a new baby boy or girl. You can use both and make it reversible, or make two different banners. There are a few of the waist aprons, as well as neck coolers, and grocery bag holders. Right now, we are experiencing problems with the live feed from USPS for the website, so it isn't quoting live shipping rates. When you only need one item, like an apron or neck cooler, it is cheaper to purchase on Etsy, since items are shipped first class mail for Etsy. Country N' More has created a new line of aprons. 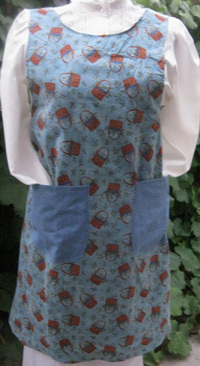 We now have clothespin aprons. 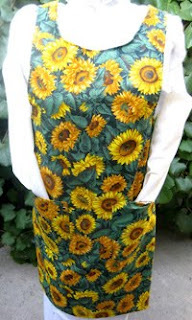 You will find that our waist aprons are longer than others sold elsewhere. They measure about 19 inches long and are made using high quality pre-shrunk fabric. Your clothespins will be handy when you need them the most. Of course, you can use these aprons for holding supplies, plus they can be used in the kitchen for making your favorite dish. Here are the first little girl apron that was made. 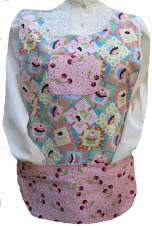 I am waiting to get more done before adding them to our website: The aprons will come in s (3-4, although I feel that it will fit a 2 year old), med (5-6), and large (7-8). We plan on adding waist aprons for little girls, more toddler cobbler aprons, plus more vintage aprons, and cobbler aprons.